Minas Ithil (Tower of the Moon) was founded in the III 3320s as the fortress and house of Isildur, and to keep watch on Mordor. In front of his house, Isildur planted a sapling of the White Tree which he had rescued from the Downfall of Númenor, and in his tower was kept one the palantiri. The motte-and-bailey fort was destroyed hundred years later by Sauron in II 3429. After the Last Alliance overthrew Sauron in II 3441, Minas Ithil was restored as a city-fortress and prospered for many years, though it was now under the rule of Anárion's son Meneldil, as Isildur planned to take up rule of his father's kingdom of Arnor. Isildur planted the seedling of the White Tree at Minas Anor in memory of Anárion, who had been slain during the War. During the early years of the Third Age, Minas Ithil was described as a beautiful sight, as moonlight filled its inner courts with silver light and its walls gleamed silver and white with moonlight. It was a walled city of white marble built on a high shelf of rock. Within the walls, there were white houses and a tall tower. The walls and the tower had many windows, and the top of the tower revolved slowly back and forth. A road ran from Osgiliath on the Anduin through Ithilien to the city and crossed the Mountains of Shadow into Mordor via the pass. Being a border-city, Minas Ithil was occasionally threatened by Easterlings, Nûrniags and Orcs, but no army ever despoiled the Garden of Gondor. When violence arrived in Ithilien, it came as the Kin-strife. Many supporters of Eldacar hid in the hills of Forithilien, safe from the sea-faring usurpers despite their proximity to Castamir's power base. Though a lieutenant under Castamir held the keys to the Tower of the Moon, the rebels held the countryside. An enemy far more deadly than any army struck in III 1636. The Great Plague ravaged Gondor and decimated the cityl. 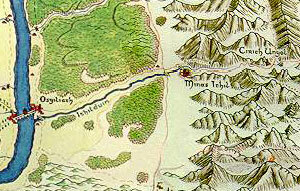 Minas Ithil remained the provincial capital of Ithilien until III 1641, when Ithilien was divided up and reorganised in South and North Ithilien. In 1650-1666, during the separation of the King and Queen of Gondor, Minas Ithil experienced a short-lived revival as the center of the Queen's court. Despite the efforts of Queen Mírien, an air of hopelessness has recently taken over the city. 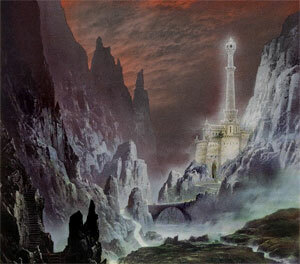 Traffic along the caravan route to Mordor and beyond has grewn infrequent, and the Watch on Mordor has been abandoned. Overall population has declined to two-thirds from the peak in the 1200s. The people of Minas Ithil consider themselves a step ahead of the rest of Gondor in virtually all reas of culture, and this attitude filters down through most aspects of daily life. Other Gondorians see the Ithilean desire to remain offbeat as a particularly rude from of arrogance. The people of Minas Ithil live in very tight extended families. They are hard-working but gaudy, fond of hard drinking and clamorous singing, deeply spiritual and fiercely independent from the rest of the kingdom. Minas Ithil attracts many free thinkers: both intellectuals and eccentrics, zealots and prophets. It is widely believed that all Ithileans are magicians, and sorcery is tolerated in the city. However, like all Gondorians, the citizens of Minas Ithil frown upon the use of sorcery, and any dabblers in the Dark Arts are apprehended and persecuted – at least outside the University, Tathrond.